Wish you could wake up every day with a perfect set of brows? Now you can! At Wake Up In Makeup, we specialise in a variety of cosmetic brow tattooing techniques. Our experienced team of specialists are here to transform, pamper and delight you with stunning results. We always put safety first and pride ourselves on offering the right advice best tailored to suit your needs! Our head technician is medically trained to ensure professional quality & achieve highest safety standards. With our semi-permanent makeup solutions, you’ll love the look of waking up gorgeous everyday. Get the treatment you want now and pay for it later in manageable interest free payments with ZipPay. At Wake Up In Make Up your technician will take the time to explain each step and make you feel completely comfortable. Owner and head technician, Julie Prior, initially began her career in nursing. After the birth of her daughter, Julie moved to the USA where she was introduced to Cosmetic Tattooing, also known as Semi Permanent Makeup. Julie has undergone years of extensive training in both the USA and the Asia Pacific region. She holds a current Queensland License, a Queensland Infection Control Qualification and is committed to ongoing training both here is Australia and overseas. She is devoted to keeping up-to-date with the latest technology and provide the highest of quality services to her ongoing and new clients. We always collectively take into account, age, hair colour, eyebrow density, face shape and your own personal preference. We make sure that you are involved throughout the entire process, it is ultimately you that has the final say in your look. Contact Julie today to discuss your desired brows and take one step further to a more beautiful you. Wow what can I say, I was so nervous however Julie reassured me the whole way through. She was very professional and I think the result is amazing. As you age your eyebrows stop growing, and I am blind so can’t do eyeliner. Thank you so much, you are amazing. Awesome experience, fantastic results. Julie explained the procedure from start to finish. Highly recommend her. And the shop is beautiful and has a very relaxing atmosphere. I will be coming back to Julie when my touch-ups are due! Who decides the shape and colour of the procedure? Ultimately the technician is trained in selecting and mixing your colours and advising on the correct shape for you. While I always advise you accordingly taking into account Age, Hair colour, Eyebrow density, Face shape and your own personal desires. It is you that has the final say in your look, your involved throughout the entire process. Conversely, most well-trained technicians will not perform a procedure if the design and/or colour requested by the client is not reasonable. If your requests are turned down by one or more technicians, then perhaps you may need to reconsider what you are asking for. What if I have recently had my eyebrows waxed? That’s fine, as long as it’s not on the same day. No waxing or tinting for 3-4 weeks post procedure. What do I need to do to my brows before my appointment? Nothing, if you intend to colour/ tint your brows please do this before coming at least 24 hours. Do not tint for 7 days after the procedure. It’s best to come with clean freshly washed skin and no moisturiser or sunscreen. If you are used to penciling in your brows it can be helpful to do this so that the technician can discuss what your used to. Whilst you will get an idea of the results after your first treatment, (and may vary from person to person) there is a healing process involved with cosmetic tattooing. We offer a free touch-up included in your price to ensure your treatment is refined and perfect. How long should my cosmetic tattoo last? 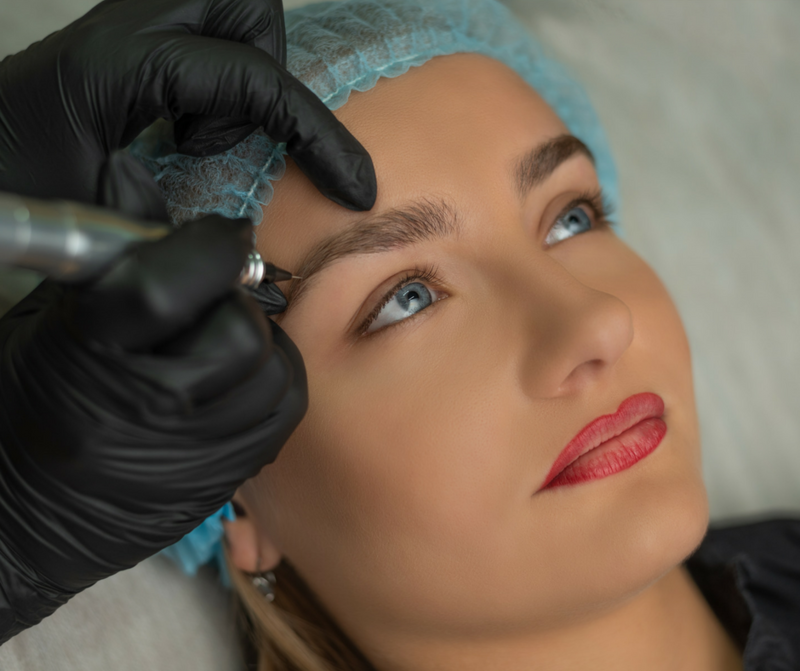 Depending on what type of procedure you have done and the colour of the pigment, you can expect your tattoo to last 18 months –five years + for eyebrows and eyeliner can last up to 5+ years or longer. Skin types particularly an oily skin can sometimes affect colour absorption and permanence. Lifestyle, after care and skin types may also affect your result. You can expect some redness for a day or two. The pigment will be quite dark for approximately a week , you may also experience some very slight tenderness and light flaking a few days post treatment. Colour fades in the first week and your true colour will be present after 3-4 weeks. Does it hurt during and after? It is very comfortable. Specific numbing agents are used for Cosmetic tattooing and I regularly have clients sleep through some of these procedures. It is not considered painful during the procedure and you may experience some very slight discomfort after for 1 day. It is certainly much less discomfort than a regular tattoo. Our cosmetic tattoo services are very affordable. Please call Julie our head technician on 0490241672 to get a price and book in your treatment. ZipPay is 100% interest free, always. There is a $6 monthly account fee that is waived if your closing balance is paid by the due date. No balance no fee. You pay nothing upfront - there is no setup fee and no hidden charges. Wake Up In Make Up is a locally owned cosmetic clinic based in Bellbird Park Queensland who provides women with permanent tattoo makeup to make them feel beautiful everyday.